Special courts sitting in secret for pre-trial hearings in terror cases are being considered by the Home Office. Security-vetted judges would weigh up sensitive evidence against suspects before cases went further. In a separate move, judges may oversee plans to allow terror suspects to be held for longer before being charged. Lord Chancellor Lord Falconer has also said it is "extraordinarily unlikely" treason charges will be used against outspoken Islamic radicals. Police and lawyers were due to discuss the treason idea this week. On special terror courts, Home Office officials say it is unlikely the plans will be ready to be included in planned new anti-terrorism laws due to be debated by Parliament this autumn. Lord Falconer said the courts could help with using intelligence material, including phone-tap evidence, used in courts without revealing informants or how the information was obtained. A judge could look at sensitive material to see if there was a way of using it in a conventional trial headed by a different judge, said the lord chancellor. That process could happen before a suspect was charged, he suggested. "There is no question of secret trials, there is no question of jury less trials, there is no question of any sort of internment," said Lord Falconer. The Home Office says any idea of moving towards a French-style inquisitorial, rather than adversarial court system, is "very long term" and not being actively considered. One possible model for the pre-trial hearings could be the Special Immigrations Appeals Tribunal, which sits in secret and keeps the details of charges from those facing them. Defendants are represented by special advocates, who have access to the evidence but do not brief their 'clients' on the details. Mr Blair last week said the government was looking at new court procedures to allow terror suspects to be held without charge for longer than the current two-week limit. 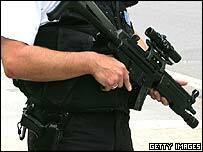 Police chiefs want the limit extended to three months because of the complexity of terror cases. Lord Falconer said that did not amount to internment but was just a "sensible period to detain suspects while sensible investigation is going on". John Denham, chairman of the Commons home affairs committee, on Monday said ministers had initially produced a considered response to the London attacks, but that its latest measures looked rushed. Those criticisms were echoed by the Conservatives and Liberal Democrats. Shadow home secretary David Davis said: "We all agree that the Government should take the necessary action to protect us all but I am concerned that instead of a clear strategy, there is too much confusion." And Lib Dem president Simon Hughes complained of "government by press release and Post It note". That was denied by Lord Falconer. He said Tony Blair had last week set out a clear list of proposals. There was already consensus on many of them and consultation would continue on others, he added. Civil rights group Liberty said the involvement of a judge in the special courts could not "sanitise an unfair process". Director Shami Chakrabarti said: "The thought of secret hearings where once again the accused will never hear the case against them fills me with dread." Ian Macdonald QC, who resigned last year as a barrister in special terror cases, said he thought the secret courts proposal might be botched. "It will, in fact, be a method of extending the detention of suspects for more than two weeks," he said.